Title: 'Idea Naturalis Americae Borealis Digito Dei Fromata Geographice Proposita An. MDCC '. 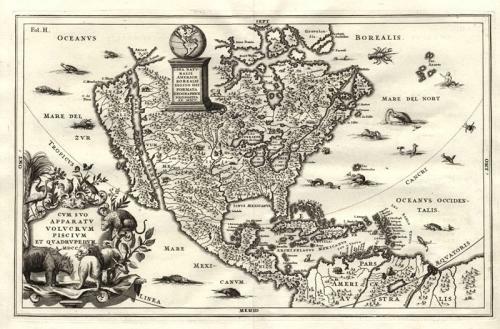 A detailed map of North America, showing California as an island, from Scherer's Atlas Novus with an interesting depiction of the Great Lakes, Florida and California and the Mississippi delta placed too far west. The map has many decorative elements including a multitide of sea creatures and animals in the interior. This is one of Scherer's most decorative maps. Ref: McLaughlin 140, Tooly 89, Leighly 154. The map is in excellent condition on clean white paper with no discernible faults bar two very small spots in the margin, well away from the engraved area.